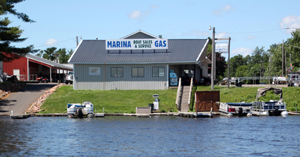 Visit out our small engine repair facility in Rice Lake, WI! Tuesday - Friday 7:00 a.m. - 4:00 p.m.
We are now in our new location across the street into the former Quik Print building. Our new address is 970 Haugen Avenue. The phone number and hours of operation have not changed. Stop in and welcome Mike to the other side of the street! 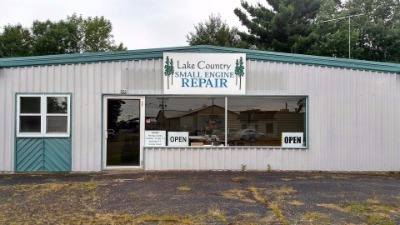 Lake Country Small Engine Repair is located in Rice Lake, WI. Mike Kenyon, formerly from Rainbow Home Center, is our manager. 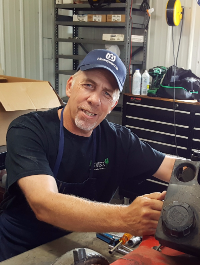 Mike brings many years of sales and service experience to our small engine shop. You can count on Mike to complete timely and professional small engines repairs. A convenient location in north Rice Lake, across from the Barron County Fairgrounds. We service all major brands of small engines with the exception of snowmobiles and ATV/UTVs. We are proud to offer the complete line of Ferris commercial mowers and Husqvarna and Simplicity lawn and garden equipment. Mike Kenyon is our small engine repair technician. Mike comes to us with 10+ years of experience in small engine repair and sales. He is the "main man" at our new Lake Country Small Engine Repair shop in Rice Lake.